Denis Lawson Ltd is a family business which is based in Duns in the Scottish Borders specialising in central heating installation, repairs and annual servicing. We specialise in Oil, natural gas and biomass fired heating systems and Denis and David will be happy to discuss your needs. Welcome to Denis Lawson Ltd, Plumbing & Heating Engineers based in Duns in the Scottish Borders. Gas Gas Fired Appliances. Annual Servicing, Repairs and Replacements. We can provide a full installation service along with alterations and improvements to your heating system. Fitting Worcester, Bosch & Glow-worm boilers which come with up to ten year warranties. Gas safe registered (Cert no 21420). Oil Oil Fired Appliances. Annual Servicing, Repairs and Replacements. We can provide a full installation service along with alterations and improvements to your heating system. Fitting Grant boilers we can provide a 5 year extended parts & labour warranties. OFTEC registered (Cert no 13787). Biomass Biomass boiler & stove specialists. Running on Wood pellets, Wood chip or logs, these can supply heating & hot water for individual or multiple properties through district heating systems. Very popular with the Governments Renewable Heat Incentive (RHI) allowing you to take advantage of the generous tariffs being offered. 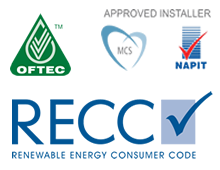 MCS (Cert no NAP22842) and Renewable Energy Customer Code (RECC) registered. Based in Duns we cover Scottish Borders, Northumberland and East Lothian We offer a wide range of services to install, maintain, repair & upgrade your heating system whither it be Gas, LPG, Oil or Biomass. From annual servicing of your boiler, cooker or fire, fault finding & repairs, efficiency checks & advice on improvements to full system installations. We are Gas safe & OFTEC registered & offer domestic gas safety checks / certificates along with landlord CP12 certificates. We also offer landlord safety certificates for all oil installations. Annual servicing - All makes of oil,biomass, LPG & natural gas boilers & fires serviced. - Cookers - Aga, Rayburn, Stanley & Esse cookers serviced. Fault finding & repairs - We carry out fault finding and repairs to all makes of oil, LPG & natural gas boilers, fires & cookers.